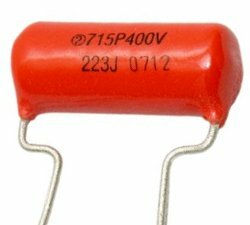 There are many myths about tone capacitors. I've seen amazing claims (along with equally amazing prices) for boutique tone caps that promise to give your guitar a vintage tone. So, what is the truth about tone caps? A tone control is a passive circuit that couples a potentiometer with a capacitor. The capacitor only allows higher treble frequencies to pass through it while blocking low frequencies. The guitar's signal passes through the tone cap, pot, and ultimately to ground (see diagrams below). This resistor-capacitor (RC) circuit is called a low-pass filter. For modern type wiring, the pickup output or input side of the volume control is connected to one of the cap's two leads and the other cap lead is connected to the tone pot wiper (lug 2). The tone pot output (lug 1) is connected to ground (see figure at left). You can also connect the pickup output or input side of the volume control to the tone pot wiper first, and connect the tone pot output to one of the cap's two leads with the other cap lead connected to ground (see figure at right). When the pot is turned up all the way, it's at maximum resistance and doesn't pass the treble frequencies to ground. As you turn the tone pot down, the resistance decreases and some of the treble frequencies pass to ground instead of the amp. When turned down all the way, the pot's resistance is near zero so all the treble frequencies pass to ground and you only hear the lower bass frequencies though the amp. This works because the guitar's signal always seeks the shortest path to ground. Note that the signal passing through the tone cap only goes to ground. The signal going to the output jack does not pass through the tone cap. This means the tone cap does not directly affect the signal going to the amp. However, using different types and values of tone caps does affect how the tone control filters out high frequencies. Capacitors have two values—capacitance and voltage. Since a guitar signal voltage is very low, the voltage value doesn't really apply to tone caps other than their physical size (higher voltage caps tend to be bigger than lower voltage caps). Capacitance is the most important value of a tone cap because it defines the cutoff point of the frequencies passed to ground. Capacitance is measured using the Farad scale. Tone caps are typically measured in microfarads (µF) or picofarads (pF). A microfarad is one millionth of a Farad, and a picofarad is one trillionth of a Farad. A lower cap value such as .022µF has a higher frequency cut-off. Conversely, a higher cap value such as .047µF has a lower frequency cut-off. So, a .047µF cap would pass more treble to ground than a .022µF cap. Simply put, the higher the cap value, the darker the bass tone sound. Cap values used for tone controls typically range from .01µF to .1µF with the more common values being .022µF, .033µF, and .047µF. Cap values also have a tolerance factor, usually a percentage between 1% and 20%, that defines the accuracy of the rated value. This means a .047µF rated cap at 5% tolerance can have an actual value between .045µF and .049µF, and at 20% between .038µF and .056µF. Caps with lower tolerances will typically have a better build quality and offer better performance consistency. The capacitance value and tolerance are printed on the cap using a 2 or 3 digit code followed by 1 or 2 letters. The digits represent the cap value in picofarads (pF) and the letters are the tolerance and optional temperature rating. The uncoded voltage rating is also printed on the cap. To decode a capacitor value, use the capacitor decoder tool. Capacitors are made from several materials including ceramic, plastic, mica, paper and glass. Just about any type of capacitor, other than electrolytic (polarized) capacitors, can be used for tone caps. The most common types are ceramic, poly film (plastic) and paper in oil/wax. Each material has different characteristics that affect the performance of the cap. Ceramic caps are the most common and cheapest type available. They range from the cheaper flat round disc ceramic caps to the better quality round or rectangular ceramics with an epoxy coating. The build quality of ceramic caps varies widely, so you should look for those with a low tolerance value of 5% or less. Ceramics can be a good choice for tone caps if you choose carefully. Poly film caps are made of plastics with the most common types being polyester and polypropylene. Polypropylene caps are perhaps the best choice for a reliable reasonably priced tone cap. From an electrical engineering perspective, poly film capacitors are typically preferred over ceramic caps for audio use. Again, look for caps with a low tolerance value of 5% or less. Paper in oil (PIO) caps are usually NOS (new old stock) or replicas of old style caps. These boutique caps are very expensive with prices of $50 or more! Some audiophiles claim these caps can noticeably improve the guitar's harmonics. For my money, a top quality poly film cap would sound just as good. So are the boutique tone cap claims true or are they a just an over-hyped myth? Only your ears can tell. The real test of a tone cap is how it sounds with your guitar, pickups, cable, effects and amp. The best way to tell which cap works best for your rig is to try different cap values and types. One way to do this is to get some cheap ceramic disc caps of various values (.01µF, .015µF, .022µF, .033µF, .047µF, .068µF) to see which sound the best to you. Then get a high quality cap like the Sprague Orange Drop 715P (pictured at top) with the value that sounds the best. The tone control can have anywhere from a subtle to a dramatic affect on a guitar's sound for any style of music. And, using the right tone cap can add new dimensions to your guitar's tone. Whether you use a high quality ceramic or poly film cap, or opt for a vintage NOS type, the tone cap you use will make a difference.